However, when we did more research, we realized that the movie based on Inferno was released just a month later, on Oct. 28, 2016. That muddied the waters somewhat. It was no longer possible to separate out interest in the Robert Langdon backlist generated by the announcement of Origin from the interest generated by the Inferno movie. Undaunted, we forged ahead to look at how this confluence of Dan Brown-related news and media impacted sales of his previous four books. All sales have been tracked in BNC SalesData, the sales tracking service for print books in the Canadian trade market. Let's start with Angels & Demons and The Da Vinci Code. Although Angels & Demons is technically the first book in the Robert Langdon series, it wasn't until the breakout hit, The Da Vinci Code, that everyone really got on board with the Harvard symbology expert. 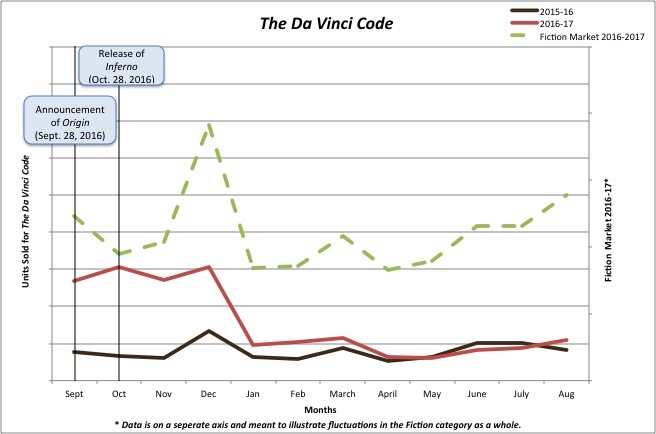 We can't release sales on individual titles but the redacted graphs below* show the sales trends for Angels & Demons and The Da Vinci Code from September 2016 to August 2017. We've compared each title's sales from the past year against sales for the same time period in the year prior, which acts as a baseline to illustrate the general trends. We've also included a trend line that shows the sales of the Fiction category as a whole (not to scale) so you can see where sales increases for these titles are likely due to the Origin announcement and Inferno movie release, rather than normal fluctuations in the market. There is a clear bump in sales for these two titles after the Origin announcement and in the lead-up to the Inferno movie release that carries through all the way into the holiday season. After the holidays, sales for Angels & Demons seem to taper off and return to the same levels as the previous year. For The Da Vinci Code, however, sales do taper off after the holiday season, but we see them start to trend back up at the end of summer 2017 in the lead-up to the release of Origin. Now let's take a look at the two later books in the series, The Lost Symbol and Inferno. Again, we can't release sales on individual titles but these two redacted graphs* show the sales of these titles from September 2016 to August 2017. We've compared those sales against the sales for the same time period one year prior as a baseline to show the general trends. We've also included a trend line that shows the sales of the Fiction category as a whole (not to scale) so you can see where sales increases for these titles are likely due to the Origin announcement and Inferno movie release, rather than normal fluctuations in the market. Interestingly, The Lost Symbol shows the second-highest sales spike in fall 2016. It was second only to Inferno, which is to be expected due to its movie release. Sales of Inferno were almost 15 times higher than sales of The Lost Symbol in October 2016. Again sales of both titles taper off after the holiday season, but The Lost Symbol does seem to trend slightly upwards over summer 2017, whereas sales of Inferno stay relatively flat through that season. Origin was released this week, on Oct. 3, 2017. It's too soon to tell how sales are going for that title, but we're confident, based on the sales of the books above, that Robert Langdon is still capable of solving the puzzle that reveals the key to our hearts. *For comparative purposes, the scales of the first three graphs, those for: Angels & Demons, The Da Vinci Code, and The Lost Symbol, are the same. The scale of the graph for Inferno is 10 times the other three.